Hardware commoditization and software are key drivers of technical evolution to produce technology we know today. At 6WIND, we participate in this networking industry trend daily as customers replace and add new routers in software on commoditized servers as an alternative to expensive hardware. We welcome this change in the networking era that is akin to the PC era in the early 1980s. I guess some of you remember MS-DOS. 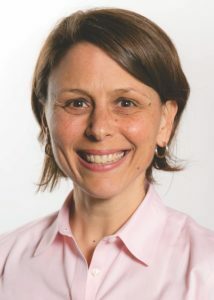 By creating an OS for PCs to run on x86 hardware, Microsoft lowered the barrier of entry and overall cost of computers towards widespread adoption. Today, we are starting to witness this same transition in networking with the router market’s transition to software as a prime example. In this blog I will highlight the evolution of vRouters, 6WIND vRouter’s software performance and customer adoption and a cost comparison of 6WIND vRouters versus Cisco ASR hardware routers. 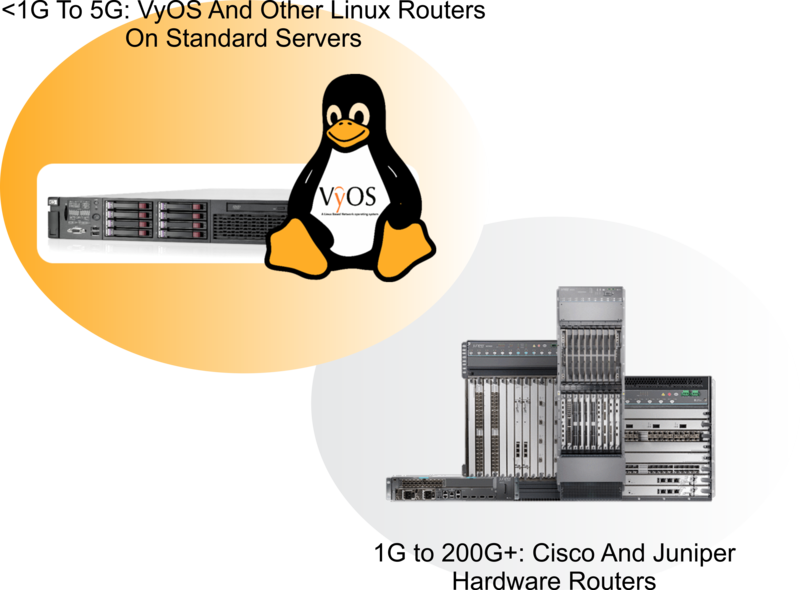 Standard hardware routers as we know them today have been available since Cisco’s introduction in the 1980s. They deliver very high performance, but at a significant expense. For over a decade now, virtual routers, or software routers, such as Vyatta’s vRouter, VyOS and other Linux routers, presented an alternative to hardware routers through software that can be installed on COTS servers. However, there was a huge performance gap between software and hardware solutions. We see this firsthand with customers who call us because their software router performance maxes out at 1 Gbps. And while hardware routers are expensive, software appliances have not been cost effective as these performance gaps caused an inefficient and sometimes wasteful use of servers. Today, thanks to advances in high performance networking, software appliances, or vRouters as we call them, have the performance to replace hardware routers on standard COTS servers. For example, at 6WIND, our vRouters deliver a range from 1 Gbps to over 200 Gbps on a single server leveraging commodity hardware. We deliver this innovation by designing our software appliances on top of the Data Plane Development Kit, or DPDK, from the ground up. This technique allows us to bypass bottlenecks in the Linux networking kernel to deliver performance that was previously only available with proprietary hardware. 6WIND’s vRouter serves as an alternative to expensive hardware-based routers as it delivers the same traditional routing and security features, with similar performance, and both traditional and IT-style management. We have no interest in vendor lock-in. 6WIND’s vRouter is open to any COTS server hardware that you select. 6WIND vRouter performance scales linearly with the number of cores deployed. Our Turbo Router software performance running on an Intel Xeon Platinum processor is impressive at 12 million packets per second per core. If you need more capacity, just add more processing cores to your configuration and enjoy similar performance whether running bare metal or in VMs. In this particular 40 core platform, over 200 Gbps can be delivered on a standard COTS server with 45% of the server capacity still available. 6WIND’s IPsec VPN performance is impressive and this is one of the reasons we’ve won so many NFV use case awards. On an Intel Xeon E5 processor, we deliver 12 Gigabits per second of throughput per core, up to 100,000 IPsec tunnels and 1,000 tunnels per second, all in software. And performance scales linearly with the number of cores. Combining VRF, IPinIP and Filtering to create IPsec VPN tunnels, we deliver 7 Gbps core. 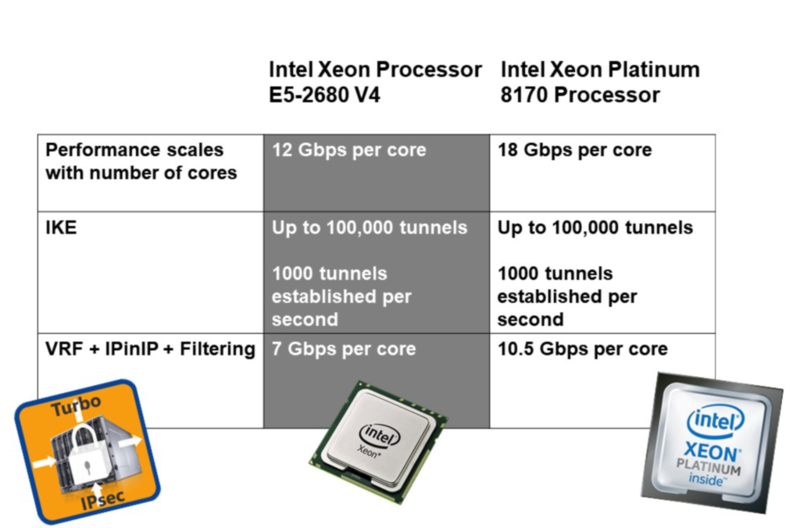 And for customers who are now leveraging Intel’s new Xeon Scalable processor family, you can see we increased performance by 50% on the new Intel Xeon Platinum processors. Here we can deliver 18 Gbps per core and 10.5 Gbps for secure VPN tunnels. It is the same 6WIND software that gives you a 50% performance increase on the latest generation processors. 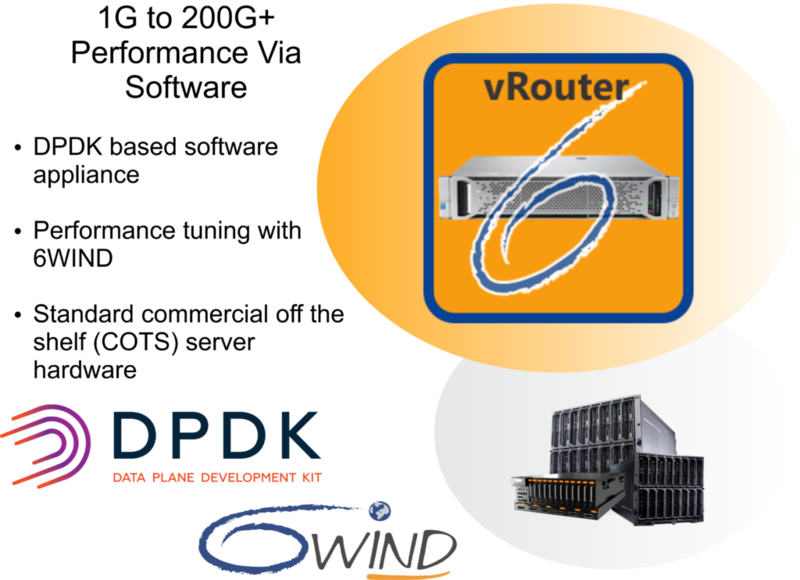 6WIND vRouters serve three discrete markets for Telcos, Enterprises and Cloud Providers. We are seeing adoption across all of these markets and here’s an example of each. Let’s start with a Service Provider example. AT&T has been a 6WIND vRouter technology customer for 5 years. 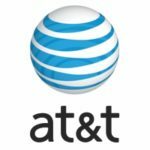 AT&T uses 6WIND’s IPsec VPN software to create its virtual VPN Internet Gateway that creates secure VPN services for its customers. AT&T was an innovator to run this service in virtual machines, versus deploying standard hardware. As a result, they reduced their CAPEX by 70% and are now using the same technology within their new SD-WAN services as well. This second example is for an Enterprise who contacted 6WIND for a Vyatta VyOS vRouter replacement. Arbor Networks is a large US DDoS protection company that runs a mission critical private enterprise training network using vRouters instead of hardware routers. Its key requirements were performance and support. Arbor ran dozens of VyOS vRouters in its network and these VyOS vRouters couldn’t handle over 1 Gbps of traffic. So Arbor selected 6WIND’s vRouters as their replacement and configured and sustained 5 Gbps each for routing and tunneling. As a result, Arbor was able to significantly reduce its hardware costs through software. Click here for the full case study. The third example is for a Cloud Service Provider. 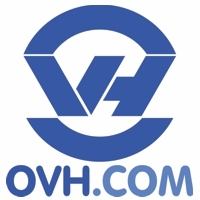 OVH is a large global cloud provider with dozens of data centers. OVH took a strategic, visionary initiative five years ago to build software routers with 6WIND vRouter technology versus buying Cisco ASR 9000 routers. OVH wrote a nice blog in French that explained the details of its approach. It stated that two legacy hardware routers each handling 120 Gbps throughput were replaced by four vRouters each handling 160 Gbps throughput, saving 90% of the cost. A global data center rollout has since followed. 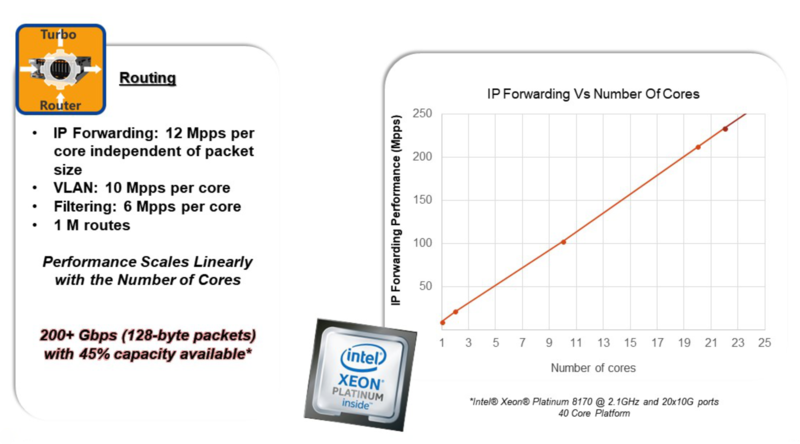 This comparison is for a customer that requires 40 Gbps of IPsec performance in its router. 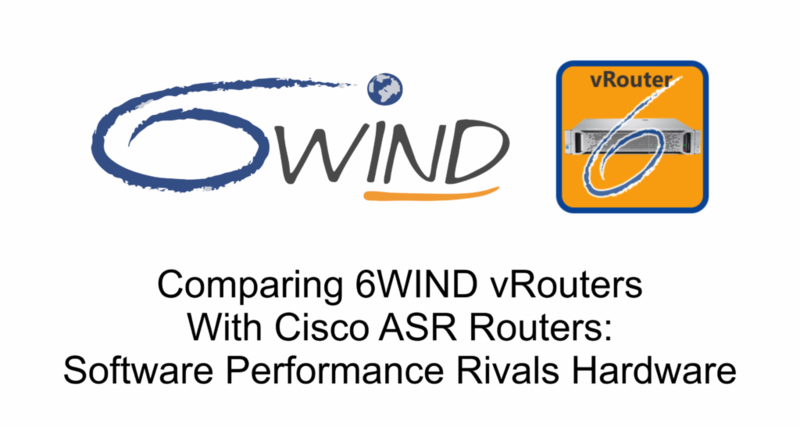 We will compare 6WIND’s Turbo IPsec vRouter with a perpetual license for 40 Gbps throughput and 40,000 IPsec tunnels versus Cisco’s ASR 1006-X hardware router. For the 6WIND solution we combine the price of our Turbo IPsec license with the cost of the server hardware, which in this case is an HP ProLiant DL380 two socket server with 12 core Intel Xeon CPUs. Then we apply a 20% discount to the combined solution. For Cisco’s hardware router we take 60% off list price. Here you can see that 6WIND is already saving over 50% of the cost. Now we add support. 6WIND’s support is 15% of list price of the solution and the first year of support is included in list price. 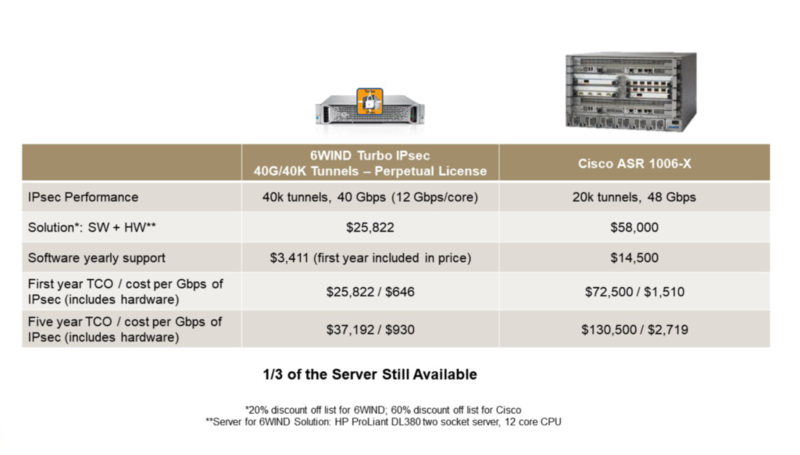 Cisco’s support is 10% of list price. Now adding the solution price and support, we can calculate the first year total cost of ownership and cost per Gbps of IPsec. 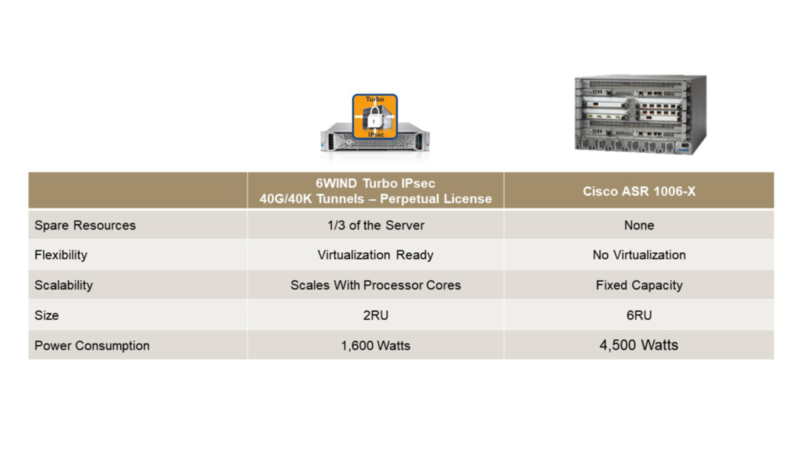 6WIND’s cost per Gbps of IPsec for the first year is $646, which is less than half of Cisco’s price. Now we can calculate the total cost of ownership over 5 years and 6WIND’s cost per Gbps of IPsec is $930 which is roughly 1/3 of Cisco’s price. And with 6WIND, 1/3 of the server is still available. This is because we have only used 16 out of 24 cores to run Turbo IPsec with 40 Gbps and 40,000 IPsec tunnels. This leaves 8 cores available, which is 1/3 of the server still available to add more performance or more applications to the existing solution. The additional value of vRouters over hardware routers is again multiplied with software. As I mentioned earlier, with 6WIND, 1/3 of the server is still available. This is where virtualization can really compound savings. If you combine the flexibility of virtualization with spare processor capacity that scales with the number of cores, you can do more on the same server, with the same software. The Cisco hardware router lacks virtualization and maintains fixed capacity, so additional hardware will need to be purchased for additional performance or applications. You can also see the big difference in space and power requirements, with 3X overall savings from 6WIND. If you are considering a vRouter for your network, contact us and schedule an evaluation. We have the performance and features of hardware, without the added costs. For more information, click here to watch the replay of our Webinar featuring vRouters vs Hardware Routers. Kelly LeBlanc is VP of Marketing at 6WIND.